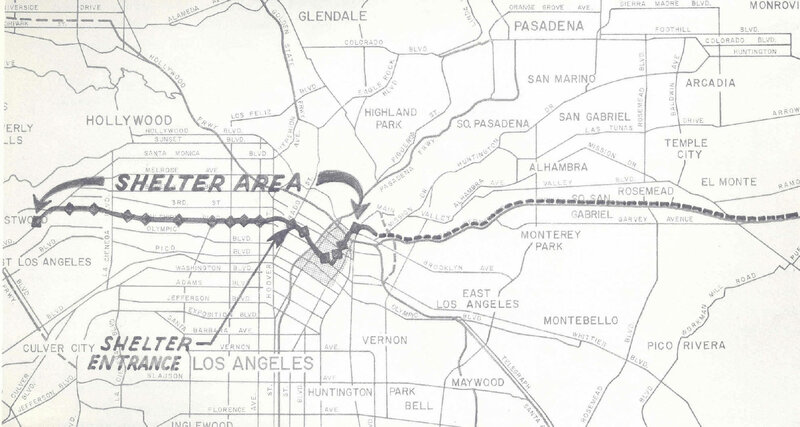 1962: Los Angeles Metropolitan Transit Authority holds a press event and groundbreaking ceremony at Wilshire Boulevard and Linden Drive in Beverly Hills for the subway portion of its proposed Backbone Route. Groundbreaking ceremonies at the other end of the proposed subway in downtown Los Angeles 11 days earlier featured the governor and other dignitaries. The Backbone Route project was never constructed, however, because no local, state or federal funding mechanism for public transit system construction yet existed. LAMTA had hoped to get some federal funding for civil defense to build subway stations that would serve as fallout shelters. More information on the groundbreaking can be found in the February, 1962 issue of The Emblem, the Metropolitan Transit Authority’s employee news magazine, and the complete story of the Backbone Route and plans for its nuclear fallout shelters, large-capacity helicopters and a Beverly Hills subway can be found in this Primary Resources blog post.